Professional Site Evaluation The patented SunEye-210 is the world-leading shade measurement tool for solar site assessment. This hand-held electronic tool measures the available solar energy by day, month, and year with the press of a button by determining the shading patterns of a particular site. The SunEye® enables the best solar designs and the highest ROI for solar professionals and their customers. It helps win competitive bids, saves time and money, and gives confidence in performance guarantees. The award-winning SunEye incorporates a calibrated fisheye camera, electronic compass, tilt sensor, and GPS to give immediate measurements in the field. 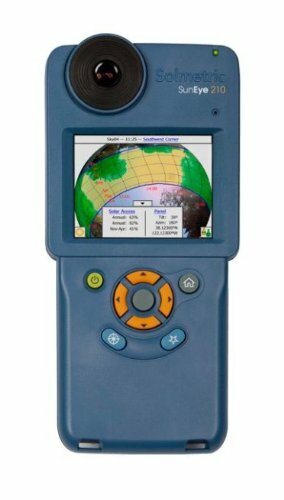 The one-handed operation, rugged enclosure, and outdoor readable display make it a reliable partner in the field. The Suneye-210 now includes a lifetime license for the PV Designer software, enabling you to import shade measurements, select modules and inverters, layout modules, simulate kWh production, and generate PDF reports. If you have any questions about this product by Solmetric, contact us by completing and submitting the form below. If you are looking for a specif part number, please include it with your message.